4 Bedroom Detached House For Sale in Surrey for Asking Price £784,950. This elegant and classically designed 4 bedroom detached executive family home with its period external features and bay windows are fully complimented internally with a finish and specification that only a modern family home can offer. With a thirty-six foot family dining and kitchen area space isn't something that's been compromised in this property! Entering this fantastic home your greeted with the entrance hallway with stairs to the first floor and doors opening into the separate lounge which is home to a lovely bay fronted window to the front and sumptuous open plan family, dining and kitchen which stretches across the rear of the property. The thirty-six foot wide open plan kitchen family area is light and airy due to the large rear windows and glass doors opening into the rear garden. The ground floor also benefits from a separate utility room, cloak room and semi integral double garage. As you step onto the first floor your greeted with a spacious gallery landing which leads you to 4 double bedrooms, the master with its lovely bay window and second bedroom are both complemented with en-suites and there is a third bathroom for the family to share. Located in the rural and lightly populated Surrey village of Bisley, predominantly surrounded by woodland, open heathland and green space this selection of beautifully crafted homes are accessed from a traditional country rural road, adjacent the woodland which complements the development and the true village setting the area has to offer. The rural charm, wealth of natural outdoor space for woodland walks on a Sunday afternoon is just outside your front door. 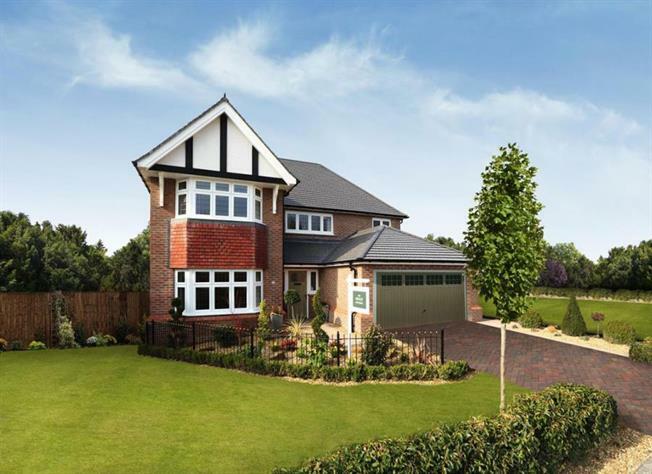 Redrow Homes have created an elegant development of houses which break away from the usual typecasts, a flowing small selection of elegant properties which are predominantly 3, 4 and 5 bedroom family and large executive detached homes. The rural, yet central location offers any lucky owner an idyllic rural lifestyle, fantastic local schools (both state and private), open countryside and true easy access to London from Brookwood station, a train commute which is just 35 minutes to London and still only a short drive away from the larger towns of Woking and Guildford. Internal images shown are of the show home or of similar property and may not be a true representation of the exact property shown. All dimensions indicated are approximate with responsibility on the buyer to confirm the exact dimensions, no liability will be held for any errors in these dimensions as they are for guidance purposes only.